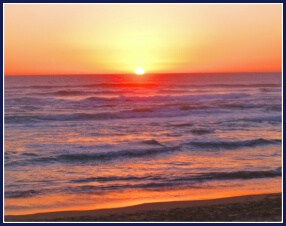 We are so lucky – we have 5 beautiful Sedgefield beaches and even in the height of our tourist season, they are never crowded. In some respects one needs to be careful because we have regular occurrences of rip tides and we only have full-time life guards on the beach during the Christmas holidays. 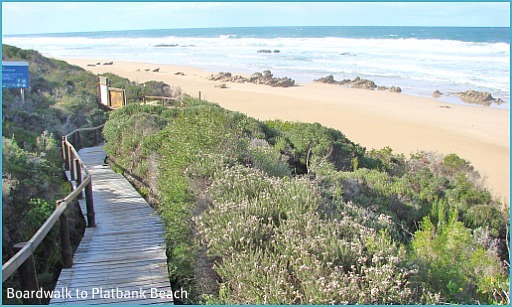 The beaches run into each other, over a stretch of roughly 6 kilometers from Swartvlei in the west to Platbank in the east. There are stretches of rock pools and then sandy beach, both flanked by impressively high dunes. Sometimes in one or two areas, it needs to be low tide to get past some places but for the most part it is possible to walk the whole distance. 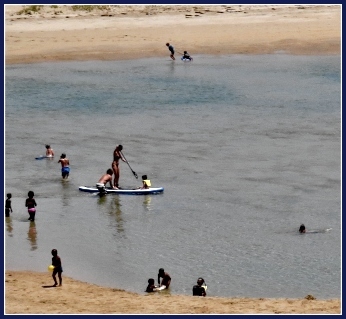 If the Swartvlei river mouth is open then there are times, depending on the river flow, that it is best crossed at low tide. 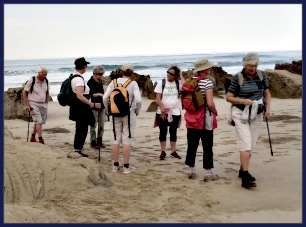 Knowledgeable local field guide, Mark Dixon does a wonderful Slackpack trail from Wilderness to Brenton that incorporates these Sedgefield beaches. 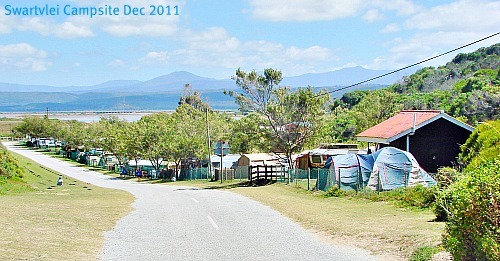 On the north side of the Swartvlei Peninsula and facing the estuary, the campsite is protected from strong winds and is delightfully rustic. Roughly half the sites have electricity making it extremely popular with families who's relatives have camped there from the earliest times. From the campsite there is easy access to the lagoon for canoeing and swimming. It's also but a short walk to the beach. From there popular Gerickes is within reach for snorkeling and offers numerous fishing spots. There are safe swimming spots but again, one needs to be careful of riptides that are powerful and dangerous currents that can sweep you out to sea in the blink of an eye. Beyond the campsite entrance, a public car park with ablutions provides parking for daytime visitors and a boardwalk is one of several access routes to the beach. This is a spectacular beach in a panoramic bay that is almost deserted out of season. As a breeding ground for the endemic Africa Black Oystercatcher, it is a protected area and no dogs are allowed on it. 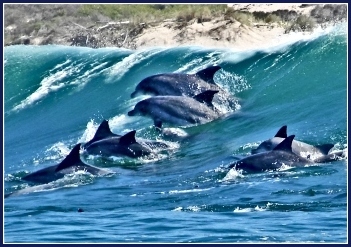 Dolphins also frequent the bay. Judy Dixon's popular "Moonlight Meander" at low Spring tide starts from this car park. 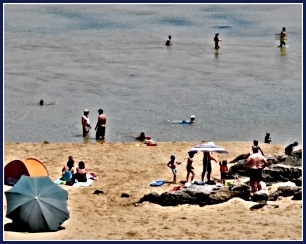 Sedgefield beaches are only allocated life guards at high season because, to tell the truth, most of the time our beaches are more enjoyed from the shore than our ocean is swum in! The lifeguards then demarcate safe bathing areas and monitor them. So if you visit when lifeguards are noticeably absent, be sure you know what you’re doing if you decide to swim in the sea. Please don’t swim if you are alone and there is no one keeping an eye on you. 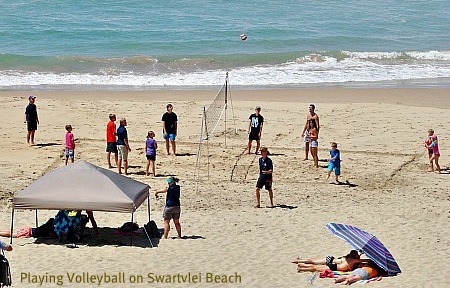 At the furthest end of Swartvlei beach is Gericke’s Point jutting out into the ocean. It reveals some amazingly weathered sandstone cliffs which are in effect fossilised dunes! 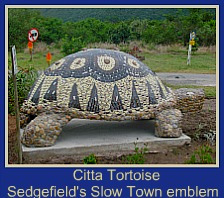 They deserve special mention here because they are a unique phenomenon in the area. 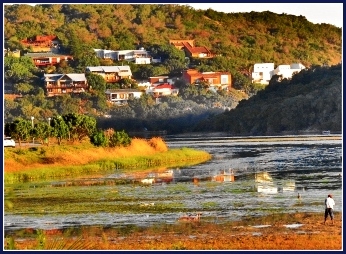 Extending from Kaaimans River in the east to Brenton-on-Sea in the west, they form borders on both sides of Sedgefield. In some places they look less like dunes and more like buttresses standing resolute and spectacular. 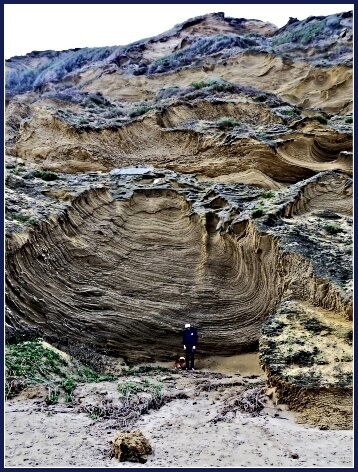 This is where the young dune only 6 million years old - a blink of an eye in geological terms - with little soil development or shrub cover, exposes the much older calcified dune that is over 120 million years old, eroded now into steep cliffs by wind, water and sand erosion. They were originally formed over 2 million years ago and were central to the development of the coastal lakes of the Garden Route region. 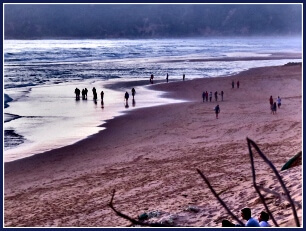 These dune cliffs along Sedgefield beaches are some of the highest on South Africa's coastline. At sunset their weathered forms offer some magnificent photographic opportunities as they change colour from golden yellow to deep rich ocre. 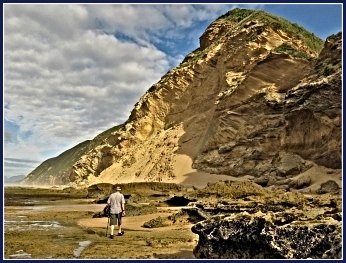 It's worth mentioning here that there are drowned fossilised dunes under the sea about 3.5kms off shore between Sedgefield and Buffalo Bay. Established on dry land, they fossilised over millennia like the ones we can currently see along our coastline until they were flooded and submerged by the rising sea. They can nonetheless be traced by boats with on-board echo sounding equipment. The best section is 12kms long and 2kms wide. At its highest point it is just 10 meters below the surface. It is an area regularly visited by fishermen. 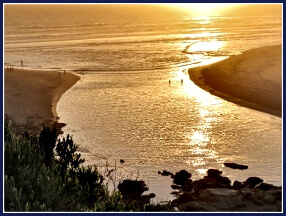 As you walk eastwards towards the river mouth, there is the long protected sand dune called the Swartvlei Peninsula that pushes the Swartvlei estuary eastwards before it breaks through the dune to the sea. The vegetated dune enhances the natural aspect of it and gives character to the village It also incorporates the Swartvlei Caravan Site. The area is frequented by a small seldom seen troop of monkeys but when the campsite is full, the monkeys seem to know and can harass the campers at times. 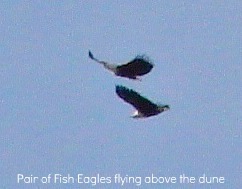 A pair of fish eagles often perch on trees on the leeward side of the dune along the Sedgefield beaches. Their haunting cries alert you to their presence. They are clearly heard from the village. How lucky are we to wake to the quintessential bird call of Africa! 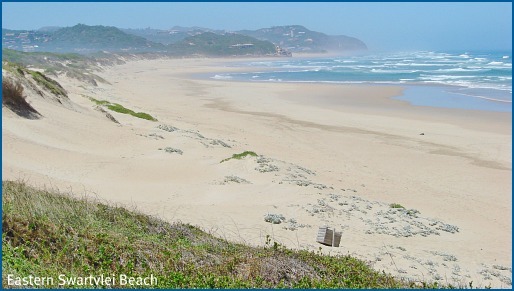 Smaller mammals, like Cape Grysbok and Bushbuck hide away in the shrubbery of Sedgefield beaches. There is a known fresh water spring that bubbles up among the fynbos on the peninsula. The dense nature of the vegetation makes much of it virtually inaccessible to humans except for around the perimeter so wildlife is undisturbed there, only threatened by poor rainfall that could affect the quality of their food and their water supply. 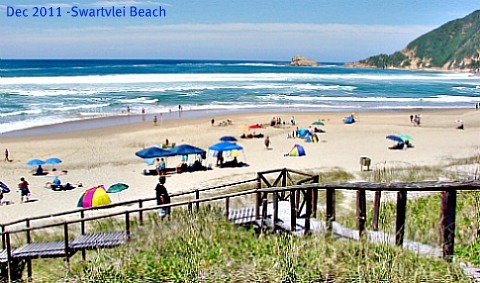 If you don’t walk to it from Swartvlei beach, there is a boardwalk from the car park down to the Sedgefield beach at the river mouth. At the river mouth, you enjoy the best of both worlds, the sea and the lagoon, because the sandstone cliffs give you shelter from the prevailing wind. You can easily indulge in a whole day on the beach. Ablution facilities and showers are available. You can spread your towel and sunbathe, or lie under an umbrella and read a book. Have a picnic lunch, go for a walk or swim in the lagoon. 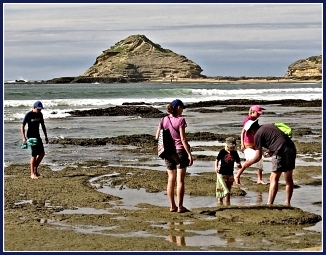 Children can play safely on the beach and in the lagoon shallows. 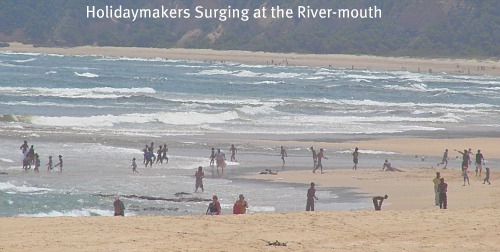 When the river mouth is open to the sea, the locals participate in a fun activity called “surging”. 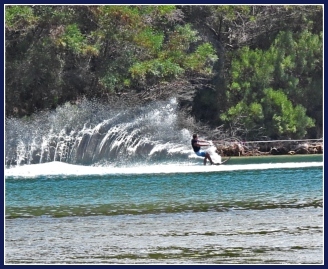 As the tide turns to come into the lagoon, water pours in through the river mouth, and you walk out into the channel, float and catch the surge finding yourself being propelled along without any effort for 200 metres and more, even further if you don’t want to walk back and do it all over again – which you do! It’s addictive! Children can do it, even young ones, with adult supervision. I’ve even seen dogs doing it (alongside their owners)! 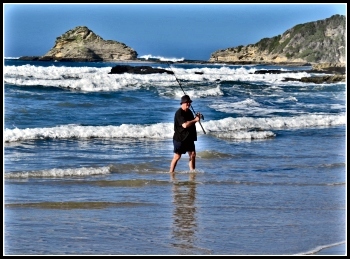 I am very careful of swimming in the sea on the Sedgefield Beaches. It is a perilous coastline in that it is subjected to some strong and dangerous currents - so be warned! Even strong swimmers can get into trouble in unfamiliar waters. Every high season, NSRI (National Sea Rescue Institute) can testify that they are called out to rescue people, and sadly a number have drowned off our coastline. Lifeguards are present on Myoli Beach and the River Mouth during high season. 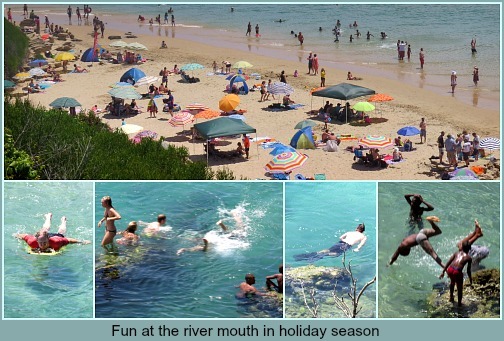 The river mouth that splits 2 Sedgefield beaches usually is calmer and safer. Again, that all depends on the tides and how the river mouth opens to the sea because that changes all the time as well. My advice is to ask the locals and don’t venture into deep water on your own if you’re unfamiliar with the area – currents change like the weather and you risk not only your own life but that of the person who may have to rescue you. The sea is unpredictable so to enjoy your holiday, respect it and be careful! 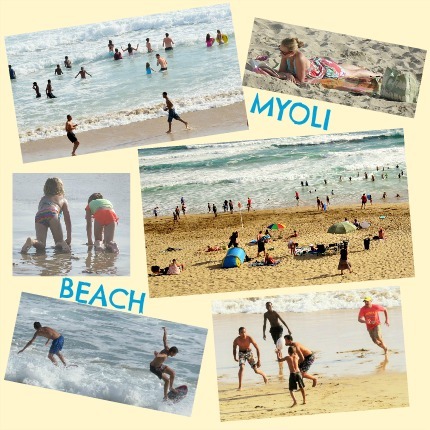 Myoli Beach and Cola Beach are adjacent to each other and named for the residential areas behind them. 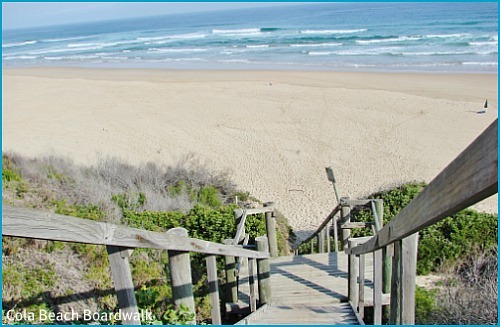 There are car parks behind the dunes that give you access to both Sedgefield beaches. 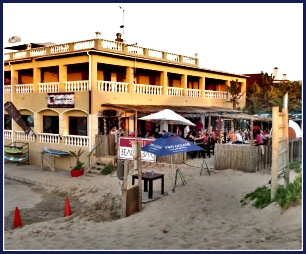 There is PiliPili restaurant and beach bar at Myoli beach and ablutions. 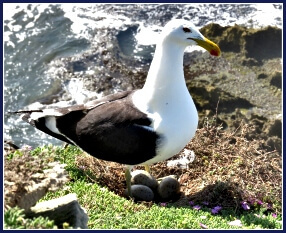 These two are the most frequented of the beaches being close to holiday accommodation and amenities. They are nonetheless, serene and uncrowded. There is a small observation platform on Myoli to whale-watch from. 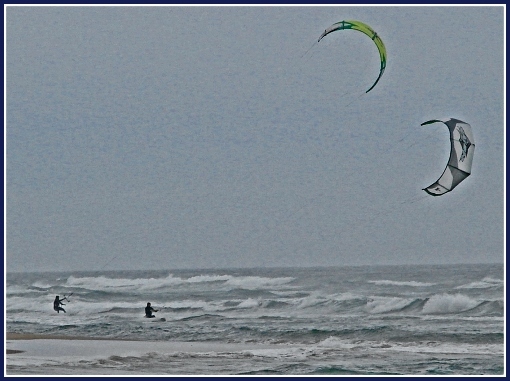 Kite-surfing is becoming very popular and when the wind is up the kite-surfers turn out in force on our Sedgefield beaches. They practise on the beach first and then take to the waves. It is a great spectator sport and exciting to watch. 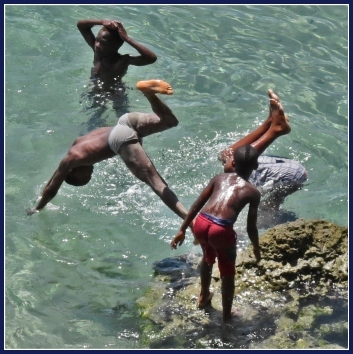 Their acrobatics as they leap above the waves and with great speed fly along the surface of the sea travelling the whole length of Cola and Myoli beaches to the river mouth and back is very entertaining. There is clearly a good deal of skill involved and strength required to hold onto the kite and manouvre at high speed through the surf. The access to Cola Beach is from a high dune that has a long boardwalk down to the beach so it also has a good viewpoint at the top of the stairway where there is a bench to sit on. 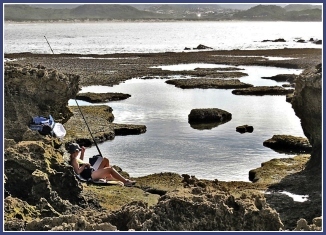 Cola beach is a popular beach to fish off and eastwards up to Platbank at Groenvlei, there are several rocky outcrops to fish from. 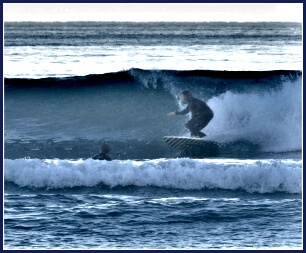 Be careful of high waves that can sweep the unwary off the rocks in a flash – it has happened and more than once! 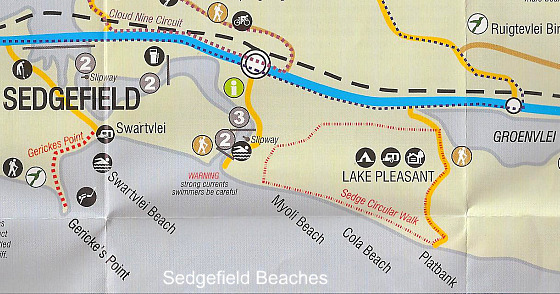 If you don’t walk to Platbank from Myoli, a distance of plus/minus 3kms, this one of Sedgefield beaches can be accessed by car by going along the N2 and turning right to Lake Pleasant. A winding dirt road leads you to the car park above the beach and a boardwalk takes you down to it. On the verge of a marine protected area and the Goukamma Nature Reserve, it has a sense of wild untrammeled beauty about it. Several stunning walks can be done in this area. You can be quite alone there and it is a beautiful place for contemplation, to sit peaceably, breathe deeply and observe the splendour of nature – the sea and the life it engenders around it. In such an instance - DON'T PANIC - that is fatal - you will drown if you're not recued! Let the current take you and let yourself float - the sea will eventually bring you back in. 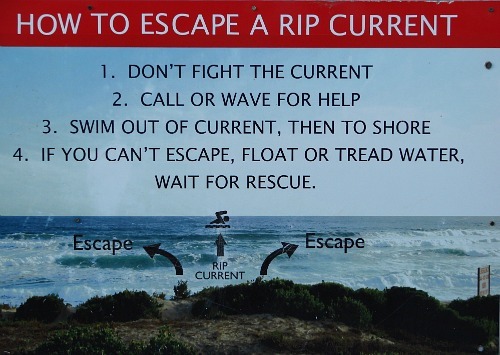 Alternatively, try to swim parallel to the shoreline. If you can get out of the riptide, you will be able to get back to shore. It can take a while so KEEP A COOL HEAD! If, on the other hand, you spot someone in trouble, don't be a hero unless you really know what you're doing. A panicked person can be extremely difficult to help. If you're determined to help, phone for back-up in the form of Sea Rescue (NSRI Sedge). Their number is 082 990 5955. Those guys know how important it is to get there fast! Gaze at the world with innocent eyes. Flow with the rhythms and lyrics of your life. Feel the joy of being alive!